1.Strong and Heathy Hair: Ugeat tape in hair extensions is made with 100% real premium remy human hair cut from young women, thick and bouncy with highest elasticity and healthy, which holds well for curly and wavy. 2.Sticky and Invisible Tapes: Ugeat tapes used sticky adhesive double side hair extensions tape, lightweight and invisible. Avoid dropping after installing. 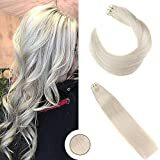 3.Shedding and Dropping Less: Ugeat tape in hair extensions are made with a new nutrient-rich solution and advanced anti-shedding technology which achieve minimal shedding and maintain your beauty for a long time. 4.Protect Buyer Policy: For order fulfilled by Amazon, please send pictures to us if you receive damaged products, we will resend a new package to you. Or if you do not like the item which is fulfilled by our Seller, you can contact us for replacement or resending, we are sure to give you a satisfied solution. 5.Product Type: Ugeat skin weft hair extensions is 20pcs/50gram per package. Usually, 2-4 packages to make a full head. There may be a little color differences between the pictures and the real items because of the different lights and monitors.